Monster cookies are definitely a favorite for our family. I sued to make them when Kristie, our middle daughter, would come home from college. Since they make such a big batch I decided to send some of them with her to work. (She always worked when she was home). Her coworkers started requesting them so we tried to make them whenever we could. 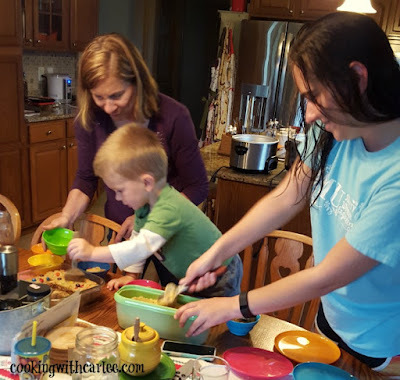 So, when we hosted her boyfriend and his parents for dinner recently I decided to try to make monster cookie dough ice cream. It was the perfect ending to a meal that included Maw-Maw's Hamburger Surprises. I used the cookie dough portion of our Cookie Dough Ice Cream as a starting point. Then to honor the oatmeal portion of monster cookies I decided to make an oatmeal-based ice cream. This turned out to be a perfect combination that everyone enjoyed. The oatmeal gives the ice cream a little bit of a different texture. If you prefer a smoother texture you could strain the ice cream base before you chill it. To make the cookie dough bites: beat the butter, peanut butter, brown sugar, vanilla and salt until well blended and smooth. Add the rolled oats and flour and beat until well incorporated. Stir in the mini chocolate chips and mini M&M's. Spread onto a cookie sheet that has been lined with parchment paper. Freeze until ready to use. To make the ice cream base: in mixing bowl, beat the sugar into the egg yolks. In a heavy medium sauce pan over medium heat, bring the milk to a slow boil. Add the oats, salt and cinnamon. Reduce the heat and return the milk to a simmer. Stirring constantly, cook for about 10 minutes. The oatmeal should be thick and creamy. Slowly beat a small amount of the hot milk into the egg and sugar mixture. Return to the pan and stir in with the remainder of the ice cream base. Allow the mixture to cool slightly then blend with an immersion blender. Stir in the cream. Cover and refrigerate several hours or overnight. Time to make the ice cream: Once the ice cream base is thoroughly cooled you can put it in your ice cream maker. 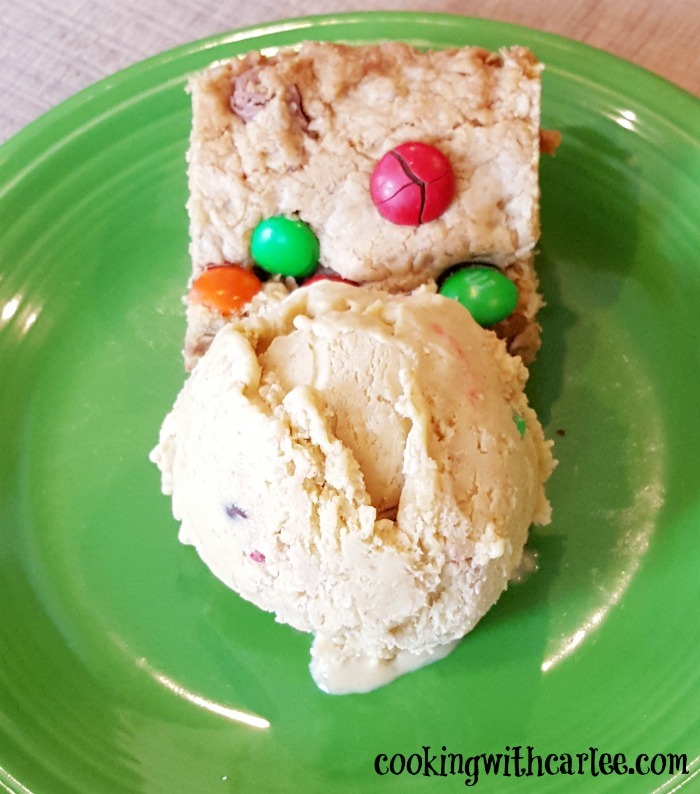 When the ice cream is done processing, break the monster cookie dough into pieces and stir into the ice cream. Place in a freezer safe container and freeze until ready to enjoy. I just made a batch of monster cookies this week with the red white and blue M&Ms. I love that the ice cream base has cinnamon in it, I am a sucker for anything cinnamon and of course anything sweet and monster cookies are my favorite too! I'm going to definitely try this for the family this summer!! I love monster cookies too, so this ice cream was an easy win for me! MiMi makes the best ice creams and she is always so creative. No two are the same but (almost) all of them are delicious! Yum! This looks amazing! I like the idea of using oatmeal in an ice cream, I've never thought of that. Soooo... not only am I going to try this ice cream, but I need to try those cookies too! Definitely, both are a must! I love throwing oatmeal in all sorts of things, so of course I loved it in ice cream too. MiMi makes some really good ice cream! Thank you! We love trying new ice cream flavors! I am a lover of cookie dough too (and ice cream!) Thanks for stopping by! 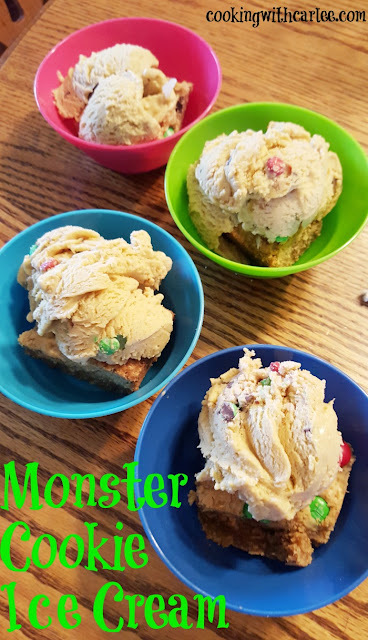 We would sure love that Monster Cookie Ice Cream! Have a great weekend and thanks so much for sharing with Full Plate Thursday. I am sure you would! Thanks, Miz Helen! great idea for an ice cream :) Looks awesome! I'd loooooooooove to eat these Mosnter Cookies Ice Cream !! Actually - who wouldn't?! Mimi, this looks incredible! I think everyone's favorite cookie has to be a monster cookie. If it's not it certainly should be! LOL What a great combination you've created? This may be our new favorite ice cream too! Yum! Just call me cookie monster! I love the idea of the oatmeal in this! Years ago grape nuts ice-cream used to be a thing, so maybe I'm preprimed to the idea of cereal and ice-cream! This sounds amazing!! I could actually see grape nut ice cream being pretty decent! I'll bet it holds its texture. How interesting! I really liked the oatmeal in here. MiMi is pretty creative. I wouldn't have thought to cook it first, but it really worked well! Yum, Yum, Yum! Looks fantastic! Thank you! MiMi makes the best ice cream! I love the idea of this ice cream! Perfect for a party! It is a fun one, that is for sure! We love our monster cookie flavored foods!